Welcome to the Vatican-sized US Embassy in Baghdad, home to a $2 million dead lawn and the world’s worst bar scene. Editor’s note: In 2009, Peter Van Buren, a two-decade veteran of the Foreign Service, volunteered to go to Iraq. Drawn by “the nexus of honor, duty, terrorism, and my oldest daughter’s college tuition,” he signed on as the head of an embedded Provincial Reconstruction Team, part of a “civilian surge” to rebuild the country and pave the way for the withdrawal of American combat troops. 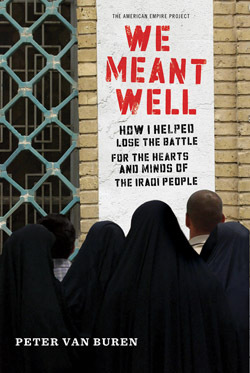 He’d joined the biggest nation-building exercise in history, a still-unfinished $63-billion effort that Van Buren compares to “past[ing] together feathers year after year, hoping for a duck.” Van Buren’s acerbic new memoir, We Meant Well: How I Helped Lose the Battle for the Hearts and Minds of the Iraqi People, recounts his two years as an official feather-paster in a country that’s become an afterthought to most Americans. The World’s Biggest Embassy (104 acres, 22 buildings, thousands of staff members, a $116 million vehicle inventory), physically larger than the Vatican, was a sign of our commitment, at least our commitment to excess. “Along with the Great Wall of China,” said the ambassador, “it’s one of those things you can see with the naked eye from outer space.” The newly opened embassy was made up of large office buildings, the main one built around a four-story atrium, with overhead lights that resembled sails. If someone had told us there was a Bath & Body Works in there, we would not have thought it odd. The World’s Biggest Embassy sat in, or perhaps defined, the Green Zone. Called the Emerald City by some, the Green Zone represented the World’s Largest Public Relations Failure. In the process of deposing Saddam, we placed our new seat of power right on top of his old one, just as the ancient Sumerians built their strongholds on top of fallen ones out in the desert. In addition to the new buildings, Saddam’s old palaces in the Zone were repurposed as offices, and Saddam’s old jails became our new jails. Conveniently for Iraqis, the overlords might have changed but the address had not. The place you went to visit political prisoners who opposed Saddam was still the place you went to look for relatives who opposed the Americans. The new embassy compound isolated American leadership at first physically and soon mentally as well. The air of otherworldliness started right with the design of the place. 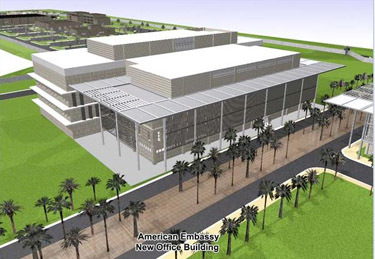 American architects had planned for the embassy grounds to have all sorts of trees, grassy areas, and outdoor benches; the original drawings made them look like a leafy college campus. For a place in the desert, the design could not have been more impractical. But in 2003, no projection into the future was too outlandish. One building at the compound was purpose-built to be the international school for the happy children who would accompany their diplomat parents on assignment. It was now used only for offices. Each embassy apartment offered a full-size American range, refrigerator, and dishwasher, as if staffers might someday take their families to shop at a future Sadr City Safeway like they do in Seoul or Brussels. In fact, all food was trucked in directly from Kuwait, along with American office supplies, souvenir mugs, and T-shirts (“My Father Was Assigned to Embassy Baghdad and All I Got Was…”, “I’d Walk a Mile for a Camel”) and embassy staff members were prohibited from buying anything to eat locally. The embassy generated its own electricity, purified its own water from the nearby Tigris, and processed its own sewage, hermetically sealed off from Iraq. Welcome to the Green Zone, now stay off the grass Kjirstin/FlickrThe ambassador, who fancied himself a sportsman, ordered grass to grow on the large sandy area in front of the main embassy building, a spot at one time designated as a helicopter-landing zone, since relocated. Gardeners brought in tons of dirt and planted grass seed. A nearly endless amount of water was used, but despite clear orders to do so, the grass would not grow. Huge flocks of birds arrived. Never having seen so much seed on the ground in one place, they ate passionately. No grass grew. The ambassador would not admit defeat. He ordered sod be imported into Kuwait and then brought by armored convoy to the embassy. No one confessed to what it cost to import, but estimates varied between two and five million dollars. The sod was put down and hundreds of thousands of gallons of water were used to make it live, in what was practically a crime against nature. Whole job positions existed to hydrate and tend the grass. 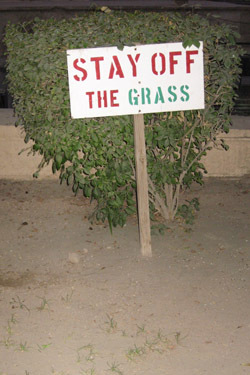 No matter what Iraq and nature wanted, the American Embassy spent whatever it took to have green grass in the desert. Later full-grown palm trees were trucked in and planted to line the grassy square. We made things in Iraq look the way we wanted them to look, water shortages throughout the rest of the country be damned. The grass was the perfect allegory for the whole war. The efforts were not wasted, as the ambassador organized an embassy lacrosse team to gambol on the lawn. At one point the official Web site featured photos of young Iraqis receiving a donation of Major League Baseball equipment on the turf. The event was a special program the ambassador was personally involved with, because he believed in “sports diplomacy.” Once he invited Iraq’s only baseball team to his residence for some drills. He wore a replica of a Japanese-born Major League star’s jersey, making the point that baseball, although invented in America, was an international sport (which is why the World Series includes only American teams and potentially a Canadian one). “Baseball is like democracy,” he liked to say, “you cannot impose it. People should learn it and accept it.” A previous sports diplomacy program donated hundreds of soccer balls to Iraq, each colorfully decorated with flags of the world. No one would play with the balls, because they included the flag of Saudi Arabia, which has a Koranic verse on it, and you cannot put your foot to a Koranic verse. Luckily, the balls were made in China, where they already knew not to include the Israeli flag, as it would have been awkward if we’d had to ask. Most of the State people at the embassy were not me or my kin. While the various job specialties in the military (mortar plate carrier and helicopter pilot, cook and General) were united by a single uniform, a common service affiliation, and an esprit de corps, the State Department was more of a confederation, where lines were rarely crossed. If my kind were strip malls, the people here were Galleria. The traditional diplomat was a big part of the organization and provided most of the upper management. While diversity played its role, this group was still mostly male, pale, and Yale in orientation if not in actual appearance. They were the deep thinkers, the plotters, the negotiators, the report writers. These folks, the ones the media always refer to as attending receptions wearing striped pants (striped pants went out of style with Hoover although many State officers have hung on to bow ties, seersucker, and men’s hats), were content in their Iraq assignments, as their work involved staying in the embassy and sending important memos to one another and to Washington, nipping out occasionally for chats with ex-expat Iraqis imported and perhaps even test-tube-bred by us for such purposes. Upper management types created their own reality and walled it off from the rest of the country. Army joke: How does the embassy keep an eye on events in Iraq? From the roof. Coming into the embassy from the field was one of the more stressful things you could do in Iraq, made worse if you drifted into Baghdaddy’s, the embassy bar. You began to understand why embassy policy forbade photography at after-work events once you learned that the most important characteristic of Baghdaddy’s was that booze was cheap. You bought a punch card for 20 dollars and drank and drank, as all the bartenders were volunteers from the embassy community and free drinks, heavy pours, and loose accounting were the norm. The serious drinkers rolled in right at 8:00 p.m. to start on two dollar shots of vodka, grain, or maybe kerosene. These were the older, former alpha males of the community, no longer able to attract mates and shorn of their once proud plumage, who just wanted to get drunk rapidly with purpose. Eight o’clock was like the VFW hall on a pale Wednesday afternoon—if you were there, you were there to drink, and if you were drinking, you wanted to get shitfaced. If you wanted to talk to anyone, you’d drunk-dial your ex-wife. The next phylum slid in around 10, the 20-to-30-year-old embassy staffers. They all knew one another and liked to dance and have a good time, basking in their youth and coolness and self-importance. Baghdaddy’s was not Wisconsin Avenue in Georgetown, but with a popped collar on a pink polo shirt, a mixed drink in a Day-Glo color, and sunglasses indoors, there was no reason why it couldn’t be undergrad glory days all over again. Life in Iraq was no more real for these people than it was for anyone else dragging slowly through a one-year tour, but it was better dressed. Things started to turn seriously sad around 11:00 p.m. Older women drifted through the door in twos and threes, with the occasional grim single. They eased on strappy sandals to take advantage of the embassy’s 800 to 1 ratio of men to women. The odd dance between the older females and the game 30-year-old undergrads would be pathetically interrupted by the stirrings of the now drunken former alphas, clumsily trying to make conversation while pushing aside the young challenger bulls from the kill site. Natural selection was not a pretty sight. The world’s worst bar scene ended when the overhead fluorescents jerked on at midnight, trapping the unsuccessful hunters in the glare. Quick words were exchanged on the dance floor in desperate attempts to seal a deal, while the serious boozers retreated to preaching from their stools and a final drink. Back in the room, late-night TV offered little solace, with an Islam Gigante Lebanese dancing show interrupted by nearly constant commercials for a Middle Eastern product called Pif Paf. Like an elderly widow who avoids dining with other aging women, knowing loneliness shared is only loneliness multiplied, Baghdaddy’s made everyone grow apart, while maintaining the illusion of bringing them together.